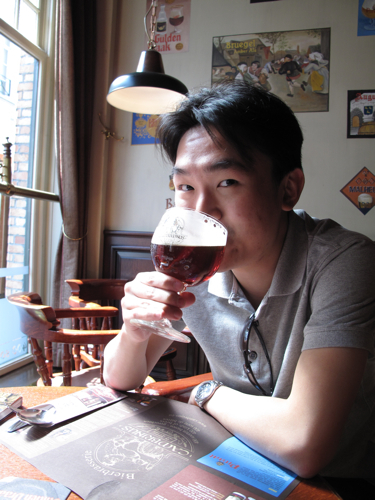 I’m back from a long Easter weekend in Belgium and in withdrawal mode having had almost 20 different beer varieties, heaps of heavenly chocolate and loads of crisp, beef-dripping-fried Belgian fries. Our first stop on our 3 day break was Bruges. Bar the occasional whiff of horsedung from the army of horse-drawn carriages doing their tourist track rounds, I found Bruges both incredibly quaint and vibrant at the same time. Despite the holiday season crowds which can often suffocate a place, the pace of things here were still wonderfully relaxing. 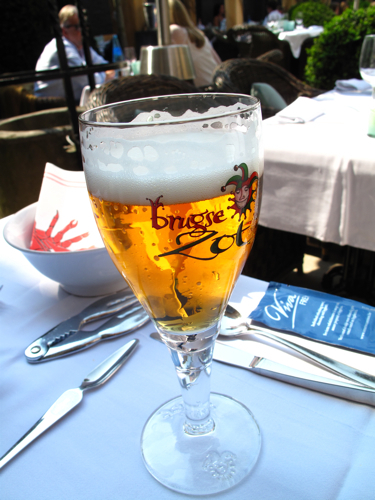 You could easily pass the time enjoying a local brew in one of Bruge’s many alfresco squares or on a quiet water-side bench watching the canal boats cruise by the town’s incredibly well-preserved medieval architecture. 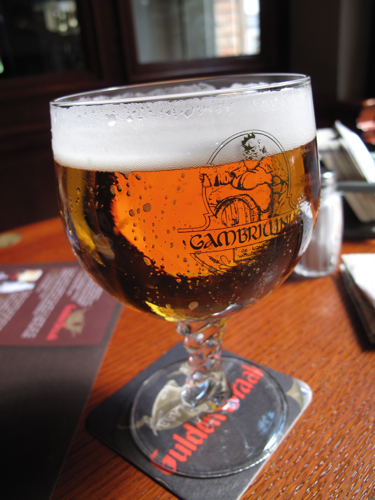 If there was one bier-brasserie we visited which really epitomised everything that was great about Bruges, it had to be Cambrinus, located on a side-street just off the town’s main Markt square. Boasting over 400 varieties of Belgium’s favourite nectar, Cambrinus’ enormous beer menu is a tribute to the god of beer himself… more an encyclopaedic anthology than your typical pub menu card. We started with a round of the house brew ‘Gambrivinus‘ which they had on tap. There were 2 types – a light pilsner-style lager as well as a stronger, abbey-style amber ale. The light beer was crisp and smooth and could easily compete with any of the great classic Czech or German pilsners. Their dark, amber ale though was more my cup of tea. Medium to full-bodied, it had multiple layers of rich, malty-caramel notes and a punchy abv-content that must have been north of 6.5%. Without a doubt, one of the best that I sampled over the whole trip. Food-wise, they serve up some seriously hearty Flemish pub-grub here, majority of which are cooked in beer of some sort. 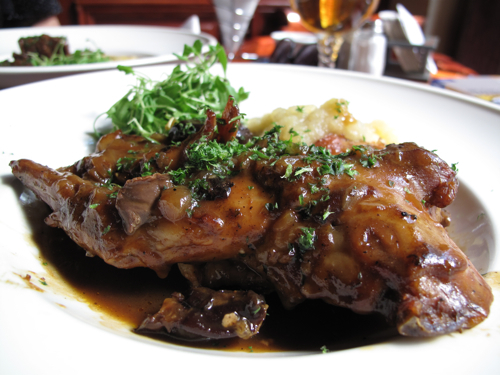 My rabbit stew, slow-cooked in prunes and the house beer was completely on the money. The sauce was rich, caramelised and full of sweet-savoury goodness with the beer adding a body to the sauce like no other. The rabbit itself must have been on steroids… its hind legs were H-U-G-E. The sheer amount of meat on it was as much as you got on a largish chicken-thigh, if not more. Juicy and absolutely dee-licious. Jo’s Carbonade was just as tasty. 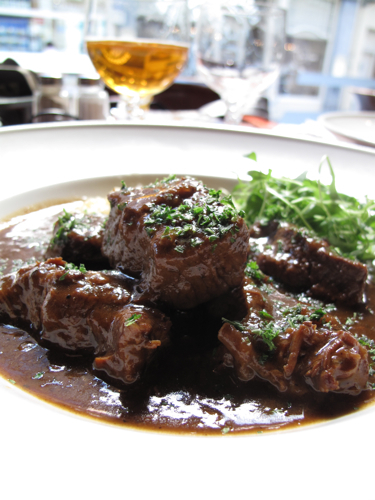 The slow-cooked beef cubes simply melted away in the mouth, leaving in its wake and explosion of beefy, beer-y goodness. We had one gripe about Flemish food in general though. As delicious as both stews were, they seemed much more winter-warmers than summer dishes and hence felt a a bit out of place given the searing early summer temperatures of 28°C outside. Ironically, we couldn’t help but imagine how much more we would have enjoyed the food if it was a freezing winter’s day. And now onto the pièce de resistance of the country’s cuisine – Belgian ‘french’ fries (and I’m being completely serious here without an ounce of sarcasm). It seems we have the Americans to thank for the term ‘french’ fry. Word has it that it was born during WWII after a group of French-speaking Belgian soldiers shared their national dish with their American allies. Fluffy on the inside, and wonderfully crisp on the outside from a 2nd stage of frying in beef tallow, it would seem every culinary institution we sampled across Bruges and Brussels from modest roadside stands to more upmarket brasseries, have perfected the art of frying up a pretty damn good fry. 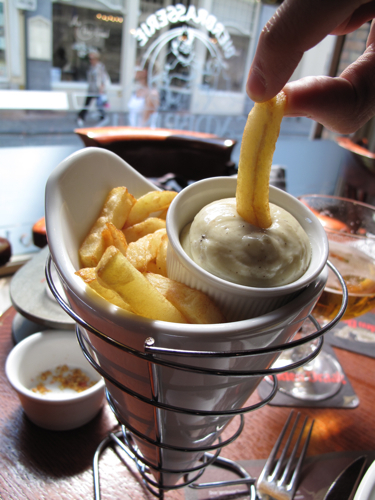 Cambrinus’ fries were no different and were perfect with a dipping of their home-made mayonnaise. After all the food and booze, we left Cambrinus (after sampling another couple varieties of beer that is) a little light-headed but without a worry in the world. Bring on the next long weekend. 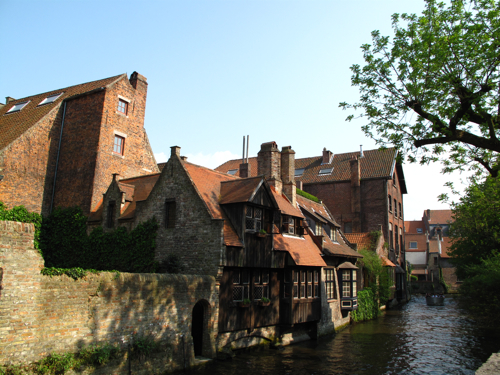 I love Bruges, I think it has such character – I much prefer it to Brussels! I’ve not tried this place before, will have to remember to drop in if I visit Bruges again. That rabbit dish looks delish. 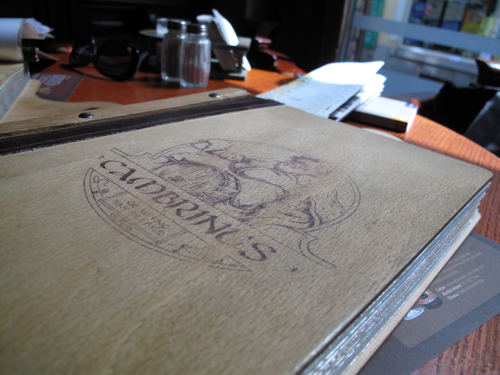 SuYin: This was actually my fav restaurant of the whole Belgian trip. Tried some other posher places such as ‘Den Djiver’ which pairs haute cuisine with beers… couldn’t top the rabbit stew here tho.